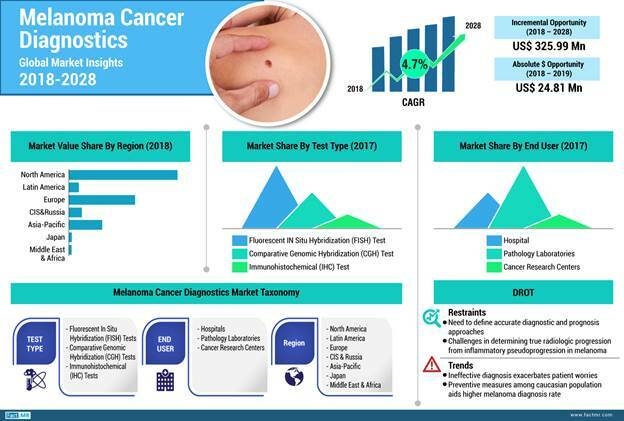 New Delhi: Growing emphasis on early detection and prevention is driving the melanoma cancer diagnostics market, with global revenue surpassing US$ 800 million in 2018, according to a new study conducted by Fact.MR. According to the report, melanoma cancer diagnostics market is expected to register CAGR of 4.7 percent between 2018 and 2028. The growth of the market is steady in countries/regions with higher prevalence of melanoma. Spending on advanced and safe melanoma cancer diagnostics is growing in the US, as efforts to diagnose the disease at an early stage gain traction. The American Academy of Dermatology estimates around 9,500 people in the US are diagnosed with skin cancer and more than 1 million people in the US are living with melanoma. With skin cancer as most common form of cancer in the US, an increasing number of people are receiving skin cancer diagnosis every year compared to other type of cancers. Extensive usage of tanning beds is also leading to the rise in melanoma cancer rates globally. Researchers have also found that UV light from sun and tanning beds not only causes melanoma but increases the risk of benign mole which can progress to melanoma. Europe also shows potential for expansion in melanoma cancer diagnostics owing to the treatment rates, government initiatives supporting diagnosis and treatment, and availability of premium drugs. High sensitivity, specificity and speed at which assays can be performed is resulting in significant use of Fluorescent In Situ Hybridization (FISH) test in both research and diagnosis of skin cancer and solid tumors. The study estimates FISH Test to witness steady growth, exceeding US$ 300 million in 2018. FISH is offering identification of genetic changes that are too small to be visible under microscope. Moreover, FISH test is not required to be performed on the cells actively dividing making it faster than other types of test. With an emphasis on early detection of skin cancer, FISH is becoming a vital tool to detect cancer. FISH is also witnessing significant adoption in detecting melanoma cancer diagnosis compared to Comparative Genomic Hybridization (CGH) Tests, owing to the technical limitations in CGH. With a significant rise in melanoma cancer, diagnosis is becoming challenging, particularly in case of thin, small, and early-stage melanoma. The biopsy of lesion is performed largely at pathology laboratories to detect melanoma owing to the need for accurate results in early-stage. Majority of the skin biopsy samples are tested at pathology laboratory owing to the availability of advanced tools, microscopes, and special stains to make correct diagnosis. Regulatory standards have also been introduced to ensure materials and equipment used at labs are valid. This has resulted in the development of reliable methods and process to ensure accurate and timely report of the patient. Pathology laboratories are focusing on standard operating procedures with some alterations in molecular testing. The personalized medicine for cancer is also gaining traction, driving rapid development of molecular testing with need for information required to guide accurate treatment. The insights presented here are from a research study on Melanoma Cancer Diagnostics Market.